When the playing season is long and you’re forced to tear yourself away from the television in order to go about the business of actually living, it’s not always easy to keep up with the scores that the best players of your favorite game put on the board. These ten iPhone apps put the results you want right in your pocket, ensuring that you never have to wonder about who’s in the lead again. Yahoo! Sportacular – This is the free version of Yahoo! Sportacular, but the features are far from basic. You can track any number of your favorite teams, across a range of international sports. The app has multiple notification features, so you can tailor your experience to deliver the statistics you care about most. Yahoo! Sportacular has featured in App Store Hall of Fame, App Store Great Free Apps and App Store Essentials. ScoreMobile – Fantasy Team fans of every sport will love ScoreMobile. Player Grouping allows you to create lists, which makes tracking your fantasy teams a breeze. As well as following individual players, you can track up to the second stats on your team’s performance, transfers and breaking news. With exclusive content from theScore.com, too, you’ll never miss an important update again. 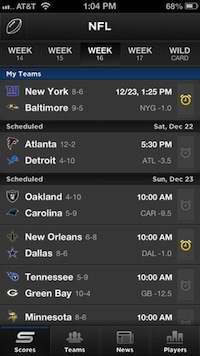 Sports Scores & Alerts – This free app supports alerts for MLB, NFL, NBA, NHL, NCAA football & basketball. Where Sports Scores & Alerts trumps other free score tracking apps is in the number of ways you can customize alerts. Rather than using generic alerts, the app allows you to set up conditions for each of the supported sports, giving you a completely personalized experience of the game. Scorekeeper XL – This is not the most complicated or featured packed app on the list, but it does provide complete flexibility in its simplicity. As Scorekeeper XL works on the basis of the user entering player, team and score details, it works well for building your own scoring databases. This simple feature also means that you can track scores for your own amateur teams, games and sports. It’s a free and should be a welcome addition to any iPhone user’s arsenal of apps. Surebet LITE – If you’re worried about missing a valuable betting opportunity, then add Surebet Lite to your list of must-have free apps. Simply enter the bet size, number of events, set the odds and then tap calculate. All that’s left to do is adjust your stake to determine how much is going to provide the most profitable return, so that you don’t put all your money on the wrong horse – so to speak. ScoreApp – This is another user controlled score tracking app, which allows you to keep a record of your favorite game and players’ scores. Score app allows you to keep tabs on up to twenty players, as well as creating unlimited rounds for any given game. It is ideal for card games, board games and sports games, but there is no reason that you can’t use it to track professional sporting event scores, too. SmartScore – As is evidenced by the name, this is a very smart app. SmartScore displays results in a traditional scoreboard format. However, the scoreboard automatically adjusts to the condition of each sport. There are a number of popular international sports supported, including soccer, tennis, football, baseball and basketball. The app is free, and available for download from the App Store. Bet Tracker Pro – Whether you’re a betting enthusiast, or just like calculating the score probabilities of your favorite sport, Bet Tracker Pro has all the features you need. Real-time stats bring you the latest news and results from Accuscore. Perhaps the greatest thing about this free app is that you don’t even need to place a bet to get the adrenaline rush. You can make your predictions as though you have, right down to defining your stake and setting the odds, and watch as your picks either triumph or fail. Score Simple Plus – An app that is designed to track user-input scores at Baseball, Basketball, Football, Volleyball (Indoor & Beach) and a number of other popular sports, Score Simple Plus is amazingly versatile. There is a free version of the app, but the pro version comes with no ads, and keeps a record of historical games, too. Scoreboard Hub – This extremely customizable score tracking app allows you to share your scores with friends via Facebook and email, set up group competitions, and name times however you like. The screen icons are set-up like the iPhone’s native navigation system, so it won’t take you long to familiarize yourself with this free app’s interface. Thank you to Paul Taylor, Marketing associate with website, Babysittingjobs.com for sharing this blog with the Sports Techie community. Sports Techie, There are many reasons for keeping score of your favorite game with an iPhone app optimized for the iOS operating system. Follow every team or player from fave childhood teams you loved or the teams in the new city you live in as an adult. Yahoo Spectacular is the number one app for several sports business reasons. Yahoo sports has more unique views than any other sports website. Their recent purchase of the Tumblr social media platform and the addition of thousand of bloggers and younger sports fans will help Yahoo stay on top for the foreseeable future. Yahoo sportsbiz got a well timed content and infrastructure shot in the arm from this startup acquisition. Smartphone apps that are free are the best purchase but do not dismiss the incredible value that these for pay apps provide. Playing board games or having access to exclusive content might be the best way to go for many Sports Techie. You may want scoreboard follow options for sport like volleyball or a number of exciting NCAA sports other than the big four of NFL football, Playoff NBA basketball and NHL hockey, and MLB baseball. The data and statistics available from most of these apps are critical for deep analysis of scores. Keeping track of the odds is a wonderful tool for bettors who want to have a digital competitive edge when placing bets. If you are a fantasy sports player you will love how the apps content and real-time updates helps your team win Championships. I hope this detailed list helps you with fulfilling your sports score needs as the dog days of summer sports approaches here in the United States and around the world. Thank you for letting your fellow Sports Techie know below in this blog or via our social media network links below your comments about these apps or any others that are worthy of consideration for tracking a favorite score. My first Sports Techie son is due today so off I go to help with the birth of our baby at Swedish hospital Ballard. THANK YOU VERY MUCH!, THESE iPHONE APPS ARE EXCELLENT!